Bridging the gap between folk, pop and rock, this singer/songwriter has created a musical genre all his own. Kevin Wood, Southern California's very own 'Contemporary Piano Man' is carrying audiences on a musical journey. Drawing influences ranging from legendary piano men like Billy Joel and Elton John yet singing and writing like country's Rascal Flatts and Keith Urban, Kevin's music bridges the gap between folk, pop and country, bringing an unprecedented and refreshing sound to every listener's ear. Kevin has created a musical genre all on his own, and it is because his songs speak of the heart, of the soul, and his wisdom comes from the many travels that this talented man has taken in his youthful career. A small-town Wyoming native, Kevin pursued his songwriting and recording career in Boston, MA and attended Berklee College of Music, where such elite alumni like Melissa Etheridge, Paula Cole and John Mayer had studied. There he became one of the crem-de-la-creme performing vocalists and songwriters, and after numerous Boston showcases and club gigs, Kevin received an honorable mention in the 2000 John Lennon Songwriting Competition. 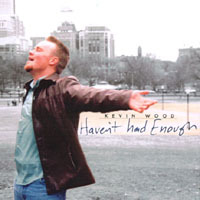 In 2002, Kevin released Haven't Had Enough, his debut album, to rave reviews and graduated from coffeehouses and clubs to perform in theatres and stadiums, joining the national tour of the hit Broadway musical RENT where he played two of his dream roles, Roger and Mark, as well as four other character roles.With major venues in over 200 cities under the buckle of his belt, and CD sales climbing across the country, Kevin pressed on to center his focus on his original music. He left his Wyoming hometown with $100 in his pocket and drove to the City of Angels in 2004, landing in Long Beach, CA. Just a short time later Kevin had begun to make a name for himself and his performances were, and still are, riveting audiences throughout Southern California. In April 2006, Kevin's original, 'Stand Firm', a song that speaks in his own autobiographical truth was performed by Orange County's own 'Men Alive' chorus. Kevin's sophomore release Finding Me is to be released October 14th, 2006. 'Stand Firm', and other favorites like 'Make it in LA', 'Don't Need to Change A Thing', '2 Years of Lonely', 'Was it the Beer?' and 'Floored' will all be on the highly anticipated album. An amazing CD! Much love to you Kevin! There is only one word that comes to mind and that is fresh..the CD has a very refreshing sound. Can't wait to hear more! wow. best way i've spent 12$ in a long time. Fantastic smooth vocals, GREAT beats and lyrics, what more could you want? i randomly bought this cd and its become one of my favorites. This debut album from Kevin Wood is, in a word, amazing. Each and every song on this album is powerful and unique, showcasing Kevin's amazing talent. Heartfelt, soulful, and just plain fun. This CD scratches the surface of Kevin's talent, every song on this CD just hints at something more. Not that this CD is lacking in any way, shape, or form.On the contrary; Haven't Had Enough is whole and bursting with life. If you like your music full of passion, music that will move you without being too sappy, music that makes you weak in the knees while at the same time giving you wings, this is the CD for you. Keep an eye on this artist folks - he's a keeper. Haven't Had Enough is just incredible. The lyricism is incredible. And this mans voice is so powerful and SO great! It's just beautiful. Everyone needs to pick up a copy...so worth the $14(including shipping!) You won't regret it AT all. This CD is great! I love the variety of the styles, the strong melodies and touching lyrics. Haven't Had Enough shows off this guy's voice and proves its versitility and strength. Awesome!! Haven't Had Enough is brilliant. The songs are fun, full of life and emotion. Every song is beautiful but not sappy. In the midst of a crazy world, love, independence, and self discovery prevail. Buy the CD b/c you are worth it and you owe it to yourself. Thnx, Kev. This CD is incredible! The songs are all very well written and performed. Maybe I'm Fire is the best song on the album! One of my favorite artists so far! I had a chance to get a copy of 14 songs on c.d. about four years ago, and as a fellow songwriter, he completely inspired me that songwriting could be this good from such a young artist, if only I still had the c.d.,I wore it out from use! just plain awesome! I am so happy that I bought this album. Kevin Wood is insanely talented and he proves it on hiw first album. His lyrics are amazing and his voice makes the hair on the back of your neck rise up. Kevin is now performing with RENT, but he has a huge future as a solo artist. Buy this album, you won't regret it.